Dr. Jones' Ultimate Canine is a Complete, All-Natural Nutritional Health Supplement for dogs. If Ultimate Canine doesn't work for your dog, you can KEEP the jar for FREE - we'll refund 100% of your purchase price, including shipping. See our full guarantee below. Total Value of all 3 Bonuses: $89.00. Order today and get your FREE downloads! Dr. Jones' Ultimate Canine Health Formula is a powder, and the regular jar contains one month's supply for dogs up to 50 lbs. Single Order - No Strings Attached! GET 50% OFF NOW AND SAVE 10% EVERY MONTH! Check the box to the left and then click the Order button above to get Ultimate Canine for $19.97 and go on our Monthly Autoship plan. On our plan, you will receive a new jar every month at the (discount) price of $35.97 plus shipping. You can cancel or suspend your plan directly in your account or change your schedule at any time by simply contacting support. Pay in US$ or CAD$. * Trial Offer available only Once per household. If you have previously ordered Ultimate Canine, Click Here to Reorder. Click Here to order more than 1 jar. Looking for a bigger jar? Click Here For our Economy Size. Dr Jones' Ultimate Canine Health Formula is not available in stores - you'll only find it here! Dr. Andrew Jones, DVM has been a practicing Veterinarian for almost 20 years. He is a strong advocate of Natural Pet Health Care, and knows that the most important way to heal our pets and prevent disease is through proper nutrition. He developed Ultimate Canine to give our dogs that extra advantage - something that will provide them with everything they need to develop stronger immune systems to fight disease, heal sore or stiff joints, and help them live longer, happier lives. *NOTE: Our Full Guarantee applies to Trial orders only. For other orders, please see our Return Policy. Click here to order your Trial Jar now! * Please see our Return Policy for non-trial and Economy size orders. So order your first month's supply Now! You know it's the right thing to do for your pet! 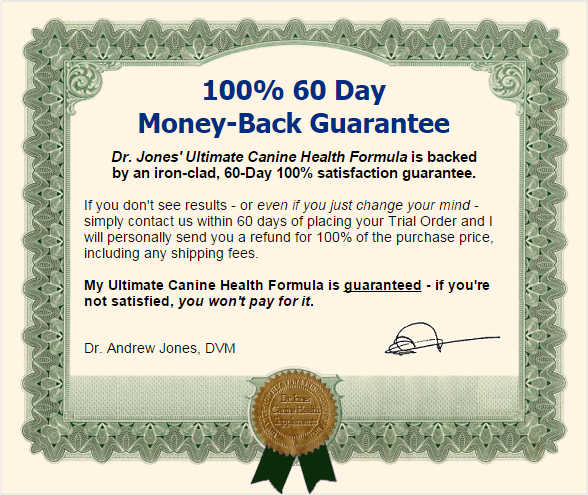 You have a full 60 Days to see if my Ultimate Canine Health Formula works for you, RISK FREE - you can get your money back at any time within 60 days, no questions asked. On top of that, you get $89.00 worth of special FREE bonuses that will further enhance your pet's quality of life! 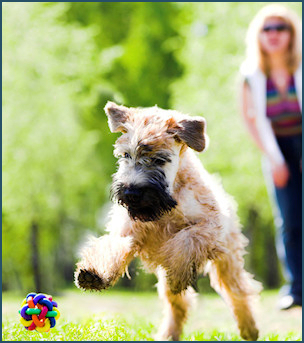 I look forward to hearing about your pet's improved health, happiness, and vitality! P.S. 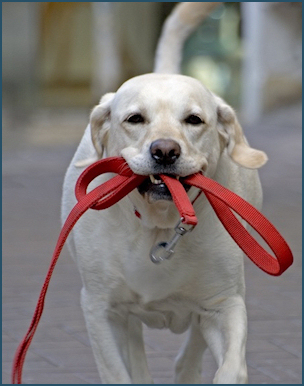 - I know everyone who truly loves their pets will want to provide for their safety and well-being. So why wait? Order now and you'll will have the chance to dramatically improve your pet's health and extend his or her life. P.P.S. - Remember that you have a full 60 days to test out my Ultimate Canine Formula, and the bonuses are yours to keep forever. The information in the Dog Food report alone is worth this investment in your pet's health. Is the Food You are Giving Your Dog Helping or Hurting? 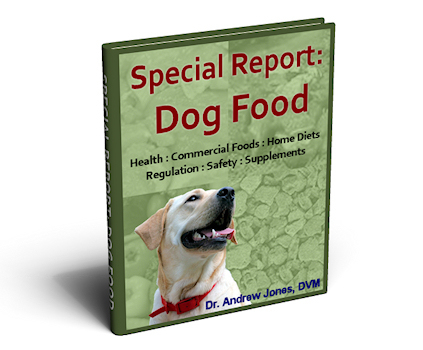 Get my FREE eBook: "Special Report on Dog Food"